Ironman Lake Tahoe (ILT) isn’t the only Ironman distance race in town. The other race of that distance is Expedition Man, August 25, 2012. Expedition Man is actually a family of races that include a race with the Ironman distance. The official Ironman race, owned by the World Triathlon Corporation, is 140.6 miles in length. The Expedition Man includes a race distance of 140.6 miles. They call this their “Ultra” distance event. 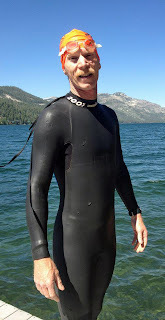 Expedition Man also has a race distance of 70.3 miles, and a dual distance Aqua Bike race. The Aqua Bike race is swim/bike only. You can also participate in any of their races as a relay team member. Expedition Man starts with a 2.4 mile swim in Zephyr Cove. This is a two-loop swim course, just like ILT. Once on their bikes, the cyclists head north on Hwy. 50 and drop down to Carson City. They head north into Washoe Valley and finish their 112 mile ride at the Legends shopping center in Sparks, Nevada. The 26.2 mile run has an out-and-back section along the Truckee River and a loop around the Sparks Marina property. The finish is at Scheels sporting goods store in the Legends shopping center. The only Ironman distance race this year in Lake Tahoe is Expedition Man. Ironman Lake Tahoe is sold-out for 2013, so if you didn’t get in, Expedition Man will be your only choice for next year as well. If you are disappointed that you didn’t get in to Ironman Lake Tahoe, think about this. The price for the Expedition Man is $325. The price for Ironman Lake Tahoe (and I paid it) is $675. No, there aren’t any Ironman slots at Expedition Man, but twice the cost for ILT? Something isn’t right.